A blog is a great way of starting a website without having to know about html or register a domain name and there are many free services available. This blog is powered by Blogger.com which is a free service owned by Google. It's very easy to set up and get started. The hardest thing is deciding what to write about. If you already have a Google account all you need to do is visit http://www.blogger.com/ and sign in using these details. If you don't have a Google Account you can create one here. 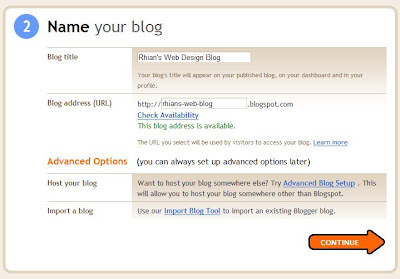 Just click 'Create Your Blog Now' in the big orange arrow and fill in the details on the next page then click Continue. On the next page you will need to fill in the details for the name of your blog. The blog title is what will appear in the header of your blog. 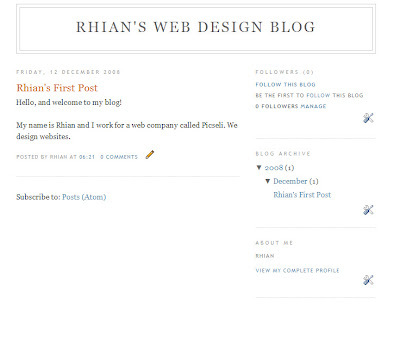 For example, 'Rhian's Web Design Blog'. The blog address is what people will need to find your blog, I would use 'rhians-web-blog' in this case. Click the 'Check Availability' link to see that the name you have chosen isn't being used by someone else. Then click continue. Select the design you like best for your blog and click continue. Yup. That's it! All you need to do now is click 'Start Blogging'. The next screen will display the Create a Post screen. Simply enter your title and blog entry and click Publish Post. Your first blog post! To view your blog, click 'View Blog'. The little pencil icon will allow you to quickly edit a post while you are logged in, and you can add Tags, change the layout, add widgets and loads more...but I'll leave that for another blog post! Again, if you do set up a blog after following this How To, please post it here. Good luck!! The site was absolutely fantastic! Lots of great information and inspiration, both of which we all need!b Keep 'em coming... you all do such a great job at such Concepts... software development can't tell you how much I, for one appreciate all you do! Such a wonderful blog post, The government should attempt genuine endeavors in regards to the advance and grant framework. By this http://www.cheapvoiceover.biz/professional-business-answering-machine-message/ of the general population can be taken to the training site to make a prosperous country. I really appreciate to the author who shares the great post. You ought to consider the adolescent and build up the stage where they can share their data. It http://infographicresume.net/latest-resume-trends-designs-and-samples/ site is additionally important for the energetic activity. Great site, It guarantees a man a rich life since it ensures a magnificent action or a reasonable business opportunity. This http://www.professionalvoicemailgreeting.net/funny-voicemail-greetings-for-cell-phones/ site is changes a man to proceed with an unrivaled life and affirmation the equivalent for his relatives. These tips are really useful for the new users. We can now create a blog by following these simple step. I see this plan of writing. Amazing post, This substance will help the overall public with understanding the real significance of preparing. Guidance is something which makes the sentiment of generosity and makes the individual faithful and click for info mindful in the overall population and his family.